But as hours turn into days, the question everyone wants an answer to is just how the government shutdown might end. Will House Speaker John Boehner (R-Ohio) cave and allow a vote on a “clean” funding bill? Will the president or Democrats weaken their current stance on negotiating over Obamacare? How long will all this go on? No one knows, of course. But I asked negotiation experts to take out their crystal balls and explain, using what they know about conflict resolution, the kind of exit strategy that might be used to bring the shutdown to a conclusion. How would they advise the president or the Republicans? What have other stalemates taught us about what could bring this crisis to a close? This is likely to get worse before it gets better. The president might choose not to negotiate on his core principles, but he’ll still have to find a way to let Republicans save face. And even if you’re dealing with hostage-takers, there’s still room to talk. Let’s take these one by one. Right now, however bad the shutdown may be for many people, neither Democratic or Republican leaders yet feel immediate pain from the fallout. Democrats know the polls show that Republicans are getting hit worse by the government’s closure. And Republicans aren’t yet getting heat from constituents for their hardline positions. But at some point, a shutdown—or worse, the potential of a disastrous default—could become so painful that it drives people to the negotiating table. But digging in their heels and waiting around for everyone to get mad enough isn’t necessarily a strategy. Seth Freeman, a professor of negotiation and conflict management at Columbia University and NYU’s Stern School of Business, says that “there’s a distinction between engagement and agreement. The subtlety here is that when you contact the other side, there’s a risk your constituents see you as going native.” That’s one problem with the current dynamic: Boehner reportedly won’t go to the table alone with Obama after some in his party tried to depose him following his fiscal cliff negotiations with the president. And now that Obama has repeatedly said he won’t negotiate over his health care law as part of the funding bill or debt ceiling crisis, even inviting the key players to talks may be seen by some as capitulation. But he and others say the president could set up a process that would take place after the first two crises are resolved, and which could give Republicans an out. “In my field we talk about substantive issues and process issues,” Bordone says. President Obama might say “I will as a matter of process agree to talk about substantive issues related to the health care law”—but only after the funding bill is passed and the debt ceiling is raised, Bordone suggests. In other words, set up a process, give it some teeth, and make a commitment. 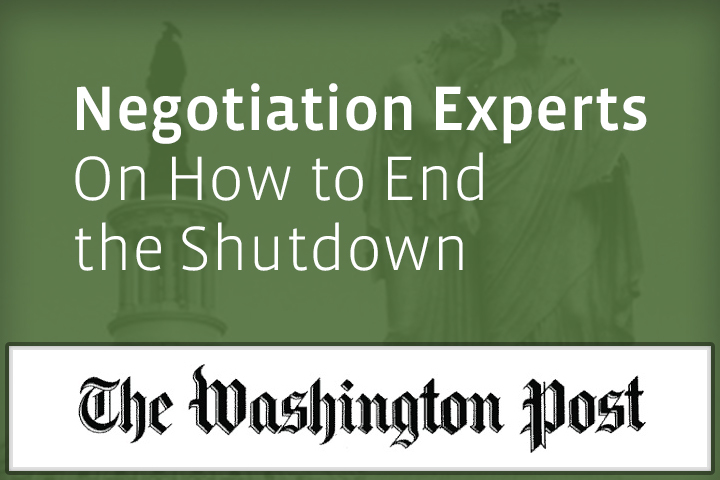 No Replies to "Negotiation Experts on How to End the Shutdown"